Ok, so a bunch of people asked how I could tell the “self-lacing” 1830s corset on Two Nerdy History Girls was actually designed to be spiral laced. ﻿﻿﻿ So we’re going to take a quick look at the all important detail that lets us know that the fascinating lacing cheat on this corset is not original to the design. There are two ways to lace things: spiral lacing and cross lacing. Spiral lacking is when the corset is basically sewn shut. The lace is anchored at the top or bottom and then laced down or up. 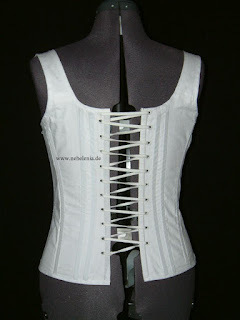 It’s easy to spot a spiral laced corset, because at the top and bottom, on opposite sides, the eyelets are half-spaced. In almost all the images I can find online of extant corsets, they have been laced incorrectly (which is why they are often tilted or uneven). Historically, almost all extant examples are spiral laced until you start to see the 2-part metal busk employed in the Victorian era. Cross lacing is how most people tie their tennis shoes. 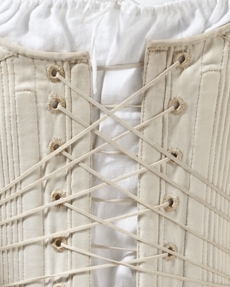 A cross-laced corset will have the eyelets evenly distributed. This method became the go-to option when the 2-part busk began to be used, because it meant that you didn’t have to unlace the corset to get it on and off. You just had to loosen it and pop the busk. Speed-lacking is a type of cross lacing. With speed-lacing, you take all the extra lacing and move it to the middle of the corset back. 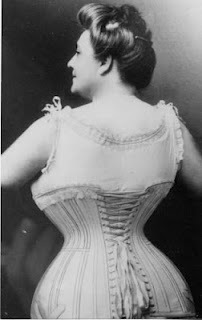 This allows most women to get into their corsets themselves and it also tends to help her reduce her waist as much as possible as all the tension is concentrated there. ﻿ If you look at the detail of the corset in question, you can clearly see that it has uneven eyelets on one side [left side top], and was thus originally designed to be spiral laced. I’d love to know at what point someone added the amazing self-lacing feature to it, but I’m not sure I’d want to wear it, as in my experience, even a tiny bit of wonkiness in the lacing can lead to major back pain. And cross lacing a spiral laced corset equals major wonkiness with the fit. You can see this in the unevenness of the lace pattern at the very top. While I certainly respect the curators who displayed and dated this corset, and I absolutely think the 1830s date for the corset itself is spot on, I think they did a disserve by not mentioning that the lacing is a later alteration. Ok, someone said they still can’t see it. So here’s the entire back. 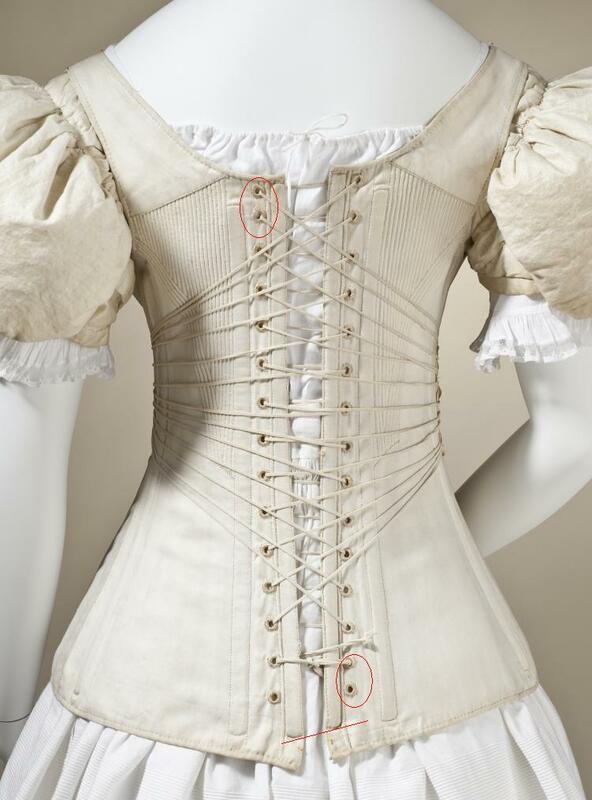 I’ve circled the offset eyelets in red, and you can clearly see that one side of the corset has been raised up in order to facilitate the cross lacing. If it were spiral laced, the top and bottom edges would be even, as the eyelets wouldn't be jury-rigged into alignment. Click on the image and you can get a much larger version where this is all easy to see. I’m back from RomCon2012 and utterly exhausted (I blame Delilah Marvelle for being the best roomie every, oh did we have some killer parties with readers and the male cover models!). So this week I’m just going to go easy on myself and feature my favorite Regency-era striped cotton pelisse/redingote. The OED dates women’s pelisse to the 1750s and women’s redingotes to the 1820s. Given the way the quote assumes you know what the garment is already, and OED personal saying that verbal usage often predates written records by 20-50 years, I’m going to go out on a limb and stick with the museum’s label of Redingote, 1810-1815. I love the heavy, striped cotton. It’s so colorful. It makes me think of India (where it was very likely woven). And I love how stark it is otherwise. Just clean lines and a beautiful collar. Can't you just see a sassy heroine striding down the street in this as pale, wilting girls flee in her wake? 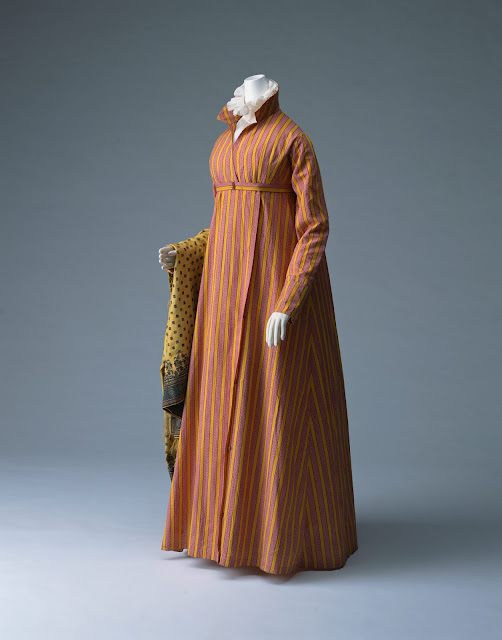 Do you have a favorite historical garment that you use for inspiration? In September 1808, a local man was fishing off the coast of Orkney when he spotted a bunch of birds feasting on an animal corpse on the rocks. He saw what looked like a giant sea serpent, but couldn't get close enough to be sure. It measured fifty-six feet in length and twelve in circumference. The head was small, not being a foot in length, from the snout to the first vertebre; the neck was slender, extending to the length of fifteen feet. All the accounts agree in assigning it blow holes, though they differ as to their precise situation. On the shoulders something like a bristly mane commenced, which extended to near the extremity of the tail. It had three pairs of fins or paws connected with the body; the anterior were the largest, measuring more than four feet in length, and their extremities were some what like toes, partially webbed.[... ]The skin was smooth, without scales, and of a greyish colour; and the flesh appeared like coarse ill-coloured beef. The eye was of the size of the Seal's; the throat was too narrow to admit the hand. I just want to say I respect whichever of the observers (described by the Library as "respectable individuals," in case we were worried) stuck his hand down this thing's throat. If you're interested, the full eyewitness testimony can be accessed from Yvonne Beale's dead geocities page via the Wayback Machine, here. And it is fascinating! The bristles glowed in the dark when wet! George Sherar, tacksman (meaning, I believe, that he paid a fixed annual sum to the government in exchange for the right to collect certain traditional taxes in a designated area of Orkney, whatever he collected over the amount he paid in "rent" being his own profit), clearly had a scientific mind. He did several experiments, including putting a small piece of the animal in his lamp to see how it burned: "it neither flamed nor melted, but burned away like a gristly substance." He says "that he was the more attentive to its shape, dimensions and figure, in order to be able to give an accurate account of it to any travellers that might come to Rothiesholm," and I hope he dined out on the story for the rest of his life! The November 1808 meeting of a Natural History Society in Edinburgh gave the creature the Latin name Halsydrus Pontoppidani ("Pontoppidan's Water Snake of the Sea") in honor of an 18th century Norwegian bishop with a sea-serpent hobby. But a leading ichthyologist of the day, Sir Everard Home, a member of the London Royal Society, examined the remains and believed the creature to simply be a basking shark, a large fish common in the Orkney waters. Several scientists since then have supported his conclusions. [...]as only the upper half of the animal's tail fin carries the spine, the lower half rots away and provides a convincing serpentine tail. When the dorsal fin begins to decompose, the remaining rays can have the appearance of a hairlike mane. The monster's six legs can simply be explained away as the remains of the shark's lower fins. The thing is, the largest recorded basking shark is only 40 feet in the length, and the Stronsay Beast was carefully measured by more than one person as being in the 55 foot range (and part of the tail seemed to be missing, so it might have been longer!). Sir Everard Home got around this issue by insisting that the three eyewitnesses who measured the corpse were not educated men, and must have measured wrong. Never mind that one of them was a carpenter! (The other two were farmers, but since farming in Orkney at the time involved a complicated division-of-land system that relied on a lot of measuring, I'm guessing they knew what they were doing.) He blithely announced that the creature was really only about 35 feet long. The Royal Museum of Scotland in Edinburgh has the vertebrae and bristles (although I don't remember seeing them when I was there, which makes me very sad! ), the skull and a "paw" were sent down to London and destroyed in the Blitz, and some other pieces ended up in the hands of Lord Byron. I've googled and googled and I can't figure out how! He doesn't seem to have been in Northern Scotland at the time. Anyone? Those pieces are still around and now in the John Murray Collection at the National Library of Scotland. An Orcadian scientist named Yvonne Beale (who has a degree in evolutionary, environmental and biomedical genetics from St. Andrews and a doctorate in DNA damage repair from Edinburgh's pathology department) has said she can use those pieces to determine the creature's species. But her current website is still under construction, and the archived geocities page from 2008 doesn't come to a definitive conclusion. She questions the "basking shark" theory on the ground that basking sharks only resemble plesiosaurs when pretty decayed, and nothing about the eyewitness testimony suggests that the Beast was too badly rotted. But she does say that since the Beast is cartilagenous, it couldn't be a whale or real plesiosaur, and must be a type of shark. Every other story I can find just says she's going to make an announcement, and they're all dated three or four years ago. I can't even find confirmation she was ever given permission to take samples from the remains in the National Library's possession. If you were going to use this story in a romance, who would your hero and heroine be? And seriously, how do you think Byron got those Beast pieces? The second novel in my historical fiction trilogy on the life of the doomed queen of France Marie Antoinette was published last month. 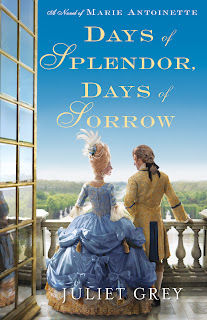 DAYS OF SPLENDOR, DAYS OF SORROW focuses on the fifteen years she reigned alongside her husband, Louis XVI, from the death of his grandfather Louis XV in May, 1774, to the days following the violent fall of the Bastille in July 1789. 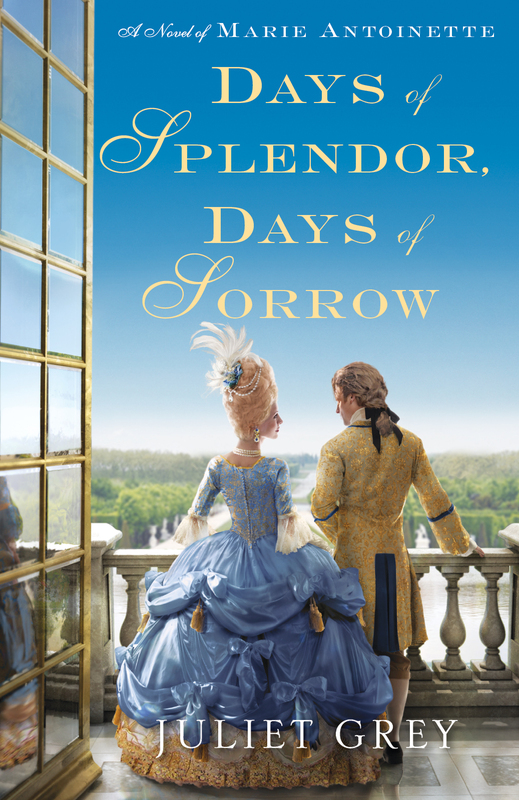 A captivating novel of rich spectacle and royal scandal, Days of Splendor, Days of Sorrow spans fifteen years in the fateful reign of Marie Antoinette, France’s most legendary and notorious queen. Paris, 1774. At the tender age of eighteen, Marie Antoinette ascends to the French throne alongside her husband, Louis XVI. But behind the extravagance of the young queen’s elaborate silk gowns and dizzyingly high coiffures, she harbors deeper fears for her future and that of the Bourbon dynasty. From the early growing pains of marriage to the joy of conceiving a child, from her passion for Swedish military attaché Axel von Fersen to the devastating Affair of the Diamond Necklace, Marie Antoinette tries to rise above the gossip and rivalries that encircle her. But as revolution blossoms in America, a much larger threat looms beyond the gilded gates of Versailles—one that could sweep away the French monarchy forever. Picking up, chronologically, where the first book in the trilogy, BECOMING MARIE ANTOINETTE, left off, DAYS OF SPLENDOR, DAYS OF SORROW covers a lot of ground, from Marie Antoinette's early years as queen when the public loved her to her struggles to consummate her marriage and bear France an heir to the hedonistic pastimes and pleasures that filled her lonely hours and offered solace and compensation for the one thing she desired most in the world--children--to a scandalous and clandestine love affair, to the disastrous "affair of the diamond necklace," which enmeshed her in the greatest con game of the century and although she was innocent, damaged her already tarnished reputation beyond measure. France was broken before Marie Antoinette arrived at the age of fourteen, already the bride by proxy of the dauphin, the future Louis XVI. The entire court lived large, with each member of the royal family having their own satellite court and entourage. They even had their own separate kitchens. The first Two Estates, the clergy and the nobility (who held the lion's share of the wealth) did not pay taxes; consequently, the Third Estate -- everyone else -- was forced to foot the bill for just about everything, and when there were natural disasters, such as bad harvests, laborers and tradesmen had nothing to pay. Louis XV had already emptied the treasury long before Marie Antoinette got there, fighting the Seven Years' War (1756-63). Every time a progressive minister proposed levying taxes on the first Two Estates, the Parlements (the judicial bodies that voted to ratify a king's edicts, and which were comprised of clergy and nobility), voted down the proposal. It was akin to a U.S. President proposing that taxes be raised on the wealthy, and the congressmen and senators who represent the interests of the wealthiest citizens consistently voting down the bill so that the wealthiest citizens continued to be tax exempt and the poorest, who could least afford it, kept getting shafted. And yet the poorest citizens didn't realize that it was the Parlements who were standing in the way of tax relief. So they blamed the king. And they blamed Louis (and Marie Antoinette) because their heads were being filled with propaganda against them. Additionally, because Marie Antoinette was a foreigner, and came from Austria, which had been an enemy of France for 950 years prior to the treaty that paved the way for her marriage, she became the scapegoat. She was even mistrusted by others at court who never endorsed her marriage in the first place. The poor woman couldn't do anything right. France's commitment in 1778 to aid the American colonists in their bid for independence from the British crown also contributed mightily to her financial woes. A series of bad harvests in the late 1780s compounded matters, and those acts of Nature, added to the plans to increase taxes on those who truly didn't have the cash to pay, spurred the commoners to heed the calls to arms from the demagogues. What many people don't realize is that the seeds of the French Revolution were sown from the top down. Right from the start of her reign, Marie Antoinette alienated many of the courtiers of the old guard who had been accustomed to certain perquisites during the reign of Louis XV. She detested court etiquette and not only downsized her entourage when she became queen, but was determined not to surround herself with the "toxic" people who had derided her when she was dauphine, preferring to maintain a few close friends around her who had not earned their perqs through centuries of service to the crown. So, she began by alienating the aristocracy (some of whom had their own printing presses in their apartments at Versailles) and never imagined her actions would come back to bite her. Add to that the liberty fever that had imbued the French noblemen who'd served as the commanders of mercenary regiments in North America during our War of Independence. These enlightened men had already read the treatises of the 18th c. philosophers such as Diderot, Voltaire, and Rousseau. They saw that self-governance could work in America and wanted a taste of it themselves. DAYS OF SPLENDOR, DAYS OF SORROW offers an intimate window into the queen's personal and family life as well as a view of the opulent Bourbon court and the schemers behind the scenes who contributed to the public opinion of Marie Antoinette as the symbol for everything that was wrong with the kingdom. The novel charts all of the events throughout Marie Antoinette and Louis' reign that led to the storming of the Bastille. There are sunny, verdant days, and there are gloomy gray ones -- as the title notes, splendors and sorrows. What's your take on Marie Antoinette? Do you think she was a scapegoat? Do you think her actions (and Louis') had anything whatsoever to do with the French Revolution or was it inevitable? This Friday, 15 June, is the 197th anniversary of the Duchess of Richmond's ball at which the Duke of Wellington learned that Napoleon was attacking not from the west as Wellington had expected but on the Allied Army's eastern flank, trying to separate them from their Prussian allies. Pouring over a map of Belgium in the Duke of Richmond's study, Wellington is said to have declared, "Napoleon has humbugged me." A number of officers joined their regiments straight from the ball and fought the next day at Quatre Bras in their ball dress. Monday, 18 June, is the anniversary of the battle of Waterloo itself. Both the ball and the battle figure prominently in my latest release, Imperial Scandal. My hero, Malcolm Rannoch, is a diplomat and intelligence agent, but Wellington presses him into servicein the battle delivering messages. I knew early on in the plotting process that I wanted to have Malcolm delivering messages during the battle, and I was very pleased to discover in my research that Wellington is actually said to have pressed civilians into service because so many of his aides-de-camp were wounded. Several of those aides-de-camp are characters in Imperial Scandal and in other fictional accounts of Waterloo, notably Georgette Heyer's brilliant An Infamous Army. One of the challenges of writing Imperial Scandal was bringing them to life as characters who were at once unique to my story and true to the actual people. Here, in honor of the anniversary of Waterloo, are some brief notes about a few of them. Lieutenant- Colonel Sir Alexander Gordon K.C.B. - younger brother of the diplomat Lord Aberdeen (later foreign secretary and prime minister). He was shot while remonstrating with Wellington to remove himself from fire. Gordon had his leg amputated and later died of his wounds in Wellington's bedchamber at the inn in the village of Waterloo that Wellington had made his Headquarters. Dr. Hume reports that when he informed Wellington of Gordon's death, Wellington said, "Well, thank God, I don't know what it is to lose a battle; but certainly nothing can be more painful than to win one with the loss of so many of one's friends." Lord Fitzroy Somerset - youngest son of the 5th Duke of Beaufort. He joined Wellington's staff in 1807 and became his military secretary in 1811. In August 1814 he married Emily Harriet Wellesley-Pole, Wellington's niece. She was in Brussels with him and gave birth to a baby daughter just weeks before the battle. Fitzroy was shot in the arm during the battle when he and Wellington were just a hands breadth apart. Fiztroy's right arm had to be amputated. Before they carried it off, he insisted on removing a ring his wife had given him. He quickly learned to write with his left hand and resumed his duties as Wellington's secretary. He was created Baron Raglan in 1852 and given command of the British troops sent to the Crimea in 1854. He died there in 1855 from complications brought on by an attack of dysentery. Lieutenant-Colonel Charles Fox Canning - Third son of Stratford Canning. Died of a gunshot wound to the stomach in the arms of his friend Lord March late in the battle, a tragic scene which Heyer beautifully dramatizes in An Infamous Army and which I also attempted to recreate in Imperial Scandal. Charles Gordon-Lennox, Earl of March - eldest son of the Duke and Duchess of Richmond. He was an aide-de-camp to Wellington in the Peninsula and took a musket ball in the chest at Orthez which was never removed. During the Waterloo campaignl he was assigned to the Prince of Orange's staff. He was present at his mother's famous ball. After the news about the French, his sister Georgiana slipped off with him to help pack his things. At Waterloo, his friend Curzon died in his arms and then Colonel Canning later in the battle. Shortly after March carried the wounded Prince of Orange from the field. In 1817 he married Lady Caroline Paget, daughter of the Marquess of Anglesey (formerly the Earl of Uxbridge) who commanded the cavalry at Waterloo. March succeeded his father as Duke of Richmond and was active in Tory politics. Have cameos by real historical figures in historical novels inspired you to research the real people? Writers, what particular challenges have you faced writing about historical figures who have also appeared in other historical novels?